Is the more laymen of the two, likely titled as such in response to Denis' post from a few months ago. Be warned, Nature is a science rag so it’s not like reading People. The second is more eggheadedly titled and gets down to the nitty gritty. Both give in depth analysis to various forms of foot strike (RFS [rear foot strike, MFS [mid foot strike], FFS [front foot strike]) and its impact on the body. You’ll need a subscription to Nature to read them, but it’s worth the money if you run. You’ll save the price many times over the next time you don’t have to buy a $150 pair of shoes. 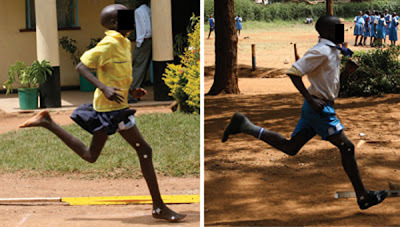 Evidence that barefoot and minimally shod runners avoid RFS strikes with high-impact collisions may have public health implications. The average runner strikes the ground 600 times per kilometre, making runners prone to repetitive stress injuries6–8. The incidence of such injuries has remained considerable for 30 years despite technological advancements that provide more cushioning and motion control in shoes designed for heel–toe running27–29. Although cushioned, high-heeled running shoes are comfortable, they limit proprioception and make it easier for runners to land on their heels. Furthermore, many running shoes have arch supports and stiffened soles that may lead to weaker foot muscles, reducing arch strength. This weakness contributes to excessive pronation and places greater demands on the plantar fascia, which may cause plantar fasciitis. Although there are anecdotal reports of reduced injuries in barefoot populations30, controlled prospective studies are needed to test the hypothesis that individuals who do not predominantly RFS either barefoot or in minimal footwear, as the foot apparently evolved to do, have reduced injury rates. pic: plus, you got to admit that the FFS looks far more graceful. Power is the strength athlete’s Holy Grail. Power (absolute strength) training is our crack. It’s addicting, and I’ve know many athletes over the years who eschew everything, even their sport’s performance, in pursuit of numbers that indicate absolute strength. 100% efficiency is the goal. At 101% you’re injured. It’s the one thing in sport that truly is extreme. It’s dangerous. It’s fun. And it’s vital if you want to achieve your body’s potential. Yesterday I had one of the best training sessions I’ve had in years. I did all the moves on my project simulation with a 10lb weight vest. 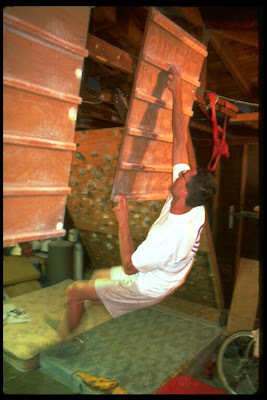 I increased my performance on every set of my hangboard workout. I did a few moves on the campus board that I’ve been too scared to even attempt this decade. When it was over I felt as though I was just warming up. I iced my fingers as a precaution. I’ve been down this road many times and had an idea of what was in store. This morning my heart rate was high, the first indicator of breakdown. My morning yoga practice was then very difficult. I’m much stiffer than normal; a reaction to the microtrauma incurred from trying to recruit high threshold muscle cell motor units. Over the coming weeks I’m going to have to be very careful. I’ve not completed a power training phase without injury or overtraining in at least a decade. Aging sharpens the edge the strength athlete teeters on. Our fast-twitch muscle fiber decreases, as does the amount of various hormones that allow us to access it. The fast-twitch muscle we have recovers even slower than it did when we were young. And those inevitable 101% attempts set us back even further. It’s no surprise that there are hoards of aging endurance athletes. There are very few power athletes. I try and explore the boundaries of both power and endurance. My challenges appear endurance oriented on the surface, mainly because anything that may be remotely impressive to an onlooker is their volume. But the thing of interest, for me, is the limit of human performance and this includes absolute strength. For this reason there is always a power element involved. Boulder problems, onsighting climbs, reacting to single track during the night, etc, all require engaging fast-twitch muscle fibers. We don’t make power workouts for Beachbody. We have power elements within our workouts. Both P90X and Insanity have a lot of plyometric work, which is the essence of power training. But it’s tempered so that you can do a lot of reps. Absolute strength training is about maximal recruitment and, ultimately, the one rep max. But this like training under the Sword of Damocles. At some point it’s going to fall. To train for health and fitness it isn’t necessary. Only athletes play beneath it. The quandary is that power training is healthy. High recruitment leads to hormonal release which is effectively anti-aging. The closer to 100% you can safely train the more effective your workout program will be. And that’s why I’m here, playing the lab rat so that you don’t have to. My goal is to find what that safe range is, and then how to increase it. This time, damnit, I’m going to get it right! pic: photos of yore: phil campusing at the castle. I'm super inspired by Will Gadd's effort on The Endless Ascent. His approach and training are exactly the kind of thing that I look for in my birthday challenges. Reading through Will's journals at Gravsports feels like deja vu as his thoughts are so similar to mine, at least for my biggest challenges (scroll down, these are worth your time). You train with a plan and still go into it with no idea about what to expect; what your body can tolerate; how your mind will respond to the torture, and whether or not you have any chance of reaching your goal. The motto at birthday challenge is that if you know you can do it then it's not a challenge. Embracing the unknown and reveling in suffering are what these challenges are about. This challenge looks brutally hard. Will can suffer with the best of 'em. He's an incredible athlete as well. But most of all he's an explorer. You have to be to push yourself under such ridiculous circumstances. Like most ultra endurance events the participant must have a sense of the absurd or they'd never consider them in the first place. To do something totally new, as Will did, takes the challenge to a different level. When something's been done before you at least have that barometer. It certainly doesn't guarantee success, or minimize suffering, but there's a comfort in knowing that someone had been where you are before. When you're breaking new ground, no matter what the circumstances, there's a void. You have no idea what’s possible, when you should stop, or at what point you're going over the edge and doing something that might kill you. For those interested in the physiology of the human body, times like these are your reason for living. For a transition phase interlude, here's a pretty cool show about Dean Potter attempting to solo the Eiger with a base rig. It's got climbing, wingsuit jumping, highlining, and a little history. Mainly, for me, it's got good footage of one of the modern routes in the Eiger, Deep Blue Sea (12c). One of these years I'm going over there, waiting out the weather, and climbing the Nordwand. It's also got commercials and is 20 minutes in total. Not sure if NBC wants it here so you might want to watch is soon, though they say you can find it on their world of adventuresports site. Had a long trip to California over the weekend to surprise my dad for his 80th where both Romney and I came down with colds. This was pretty good timing as I'd just finished the first phase of my program. Scheduled to start back up tomorrow and I should be ready. My fingers felt as though they needed the break. Did manage to explore a canyon in the middle of Nevada that just may hold the big mountain route I've been looking for. I found a wall that hadn't been climbed, at least from the guide or that I could tell, and shared a ledge under it with a mountain goat while I scoped the lines. We surprised each other. He looked more worried than I felt but he was the one with the massive horns and would have had a distinct advantage should one of us gotten territorial. But he soon as he decided I wasn't a predator he went back to grazing while I scoped the wall for weaknesses. I don't know if it's a good omen but it made me like the place, which was stunning anyway. The good omen is more likely the line of weakness up the overhanging headwall that looks as though it will accept my fingers. With the new training facility functional the New Year is in full swing. Hope you’re resolutions are just getting warmed up and you meet all of your fitness goals—or at least enough to keep you motivated for your pie-in-the-sky ambitions—in 2010. We’re eating more sustainably, doing enough exercise to keep the dogs fit, getting better at our jobs, and, if there’s time, will tick some more off our life’s to-do list. Here are my climbing ambitions for the upcoming year. 1. Finish Black Dynamite (first ascent): did the moves before construction season/winter set in. Have linked the three segments on my board. As soon as I can do them back to back I’ll be ready. 2. Link my mega traverse: my pie in the sky goal. 3. Dogma, or something else on Mt Wilson: since I’ve never climbed it. 4. Sheer Lunacy, or something free in Zion: since I’ve never freed a wall there. 5. Notch Peak, via linking Western Hardman and Book of Saturdays: if it doesn’t fall apart, because it’s a big day on the largest limestone face in the US. 6. Sacred Ground or Excommunication: because they both look amazing. 7. Monkey’s Face: because it will get me out to see friends in Oregon and it’s one of the coolest formations in the US and I’ve never climbed it. 8. Evolution Traverse (car to car of course): because I love the Sierra and it’s one of the coolest lines ever, and a massive day. 9. Climb the three major lines on Mt Olympus in a day: because it’s a massive day in my backyard. 10. Find an amazing first ascent to do in the mountains: to keep me motivated. I’ve been asked to log more actual workouts. I don’t often do this because I find it boring when I read it on other sites. I guess, however, this would depend on the person. I’d love to hear about Patxi Usobiaga or Alberto Contador’s training. But that’s always a secret. As a middling weekend warrior I certainly don’t have any training secrets, so if it can help anyone out to hear what I do I’ll record it. Here in my first cycle of training enthusiasm has been low due to “the worst” inversion anyone around here has seen. 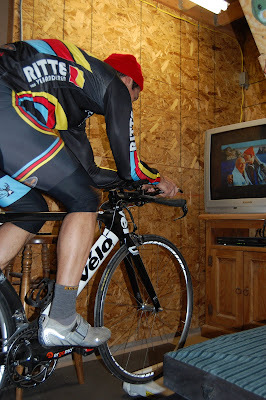 Each day is an evaluation over whether training in this air has actual benefits. I can always drive 15 minutes up the hill to get out of it, which I usually for my runs. Gym training has sucked but I’m sticking to the schedule regardless. 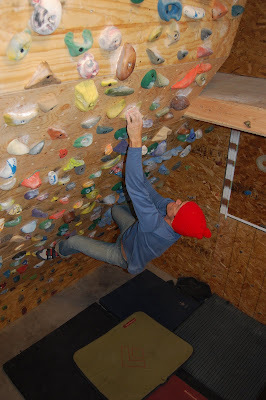 Climbing days consist of a lengthy warm-up, usually 30-45 minutes of bouldering, followed by the hangboard workout outlined in this post. I then do a series of lock-off and reaches on the systems wall. I do 4 sets of 8 reps for each arm for jugs, pockets, and undercuts. I also do an aerobic workout on this day of about an hour of hiking, running, or sitting on my trainer in the time trial position. The next day I ARC train, which is low level climbing without getting pumped to increase capillarity. I’ve been doing one set of 30 minutes in the garage. This days also includes something aerobic, as well as my foundation or stabilizer exercises. I do this for both upper and lower body. I will actually post video of these movements at some point in the future because everyone should be doing them. My lower body day is a series of one leg movements. Most of these can be found in various Beachbody workouts, and perhaps all of them in Tony Horton’s upcoming One on One for one leg workout, which he made for me (but it’ll be great for everyone, I promise). I also do some core work on this day. Since I’ve had a break from both I’m starting slow on both fronts. I set of 30 for each leg on ten different exercises, followed by one of Beachbody’s short ab or core routines. I build on each workout as I progress, trying to keep from getting sore. I finish this day with a harder run or ride or brick (ride/run). One day a week I’ve been building mileage. Last week I did a three hour run. This week is was 4:15. I’ll keep increasing this to get ready for Mexico in March. Oh, yeah. I also start almost every day with 20-30 minutes of yoga. Even though the focus is hypertrophy, the bulk of my hours training are doing low-level aerobic work. This is the burden of the endurance athlete. Still, my main focus in this cycle are my resistance workouts. And given that I was coming off a break these are almost foundation work as much as pure hypertrophy. This is cool because I don’t want to gain much muscle mass and my goal is to prepare my muscles for the upcoming strength training phase. pics: even in the most challenging circumstances, the members of Team Zissou keep moral high. There’s a good interview with Ivan Basso in the latest edition of Cycle Sport. For those who don’t know, he was Armstrong’s heir apparent in the Tour before getting busted in the Operation Puerto scandal and serving a two year suspension. In his return to the peloton this year he was a good, but not great, stage racer. While most pundits chalk this up to lack of dope, Basso offers a different perspective. Unlike Tyler’s vanishing twin, his explanation actually makes sense. Not only that, we’ll get to see it play out next season. Many cyclists’ lives fall apart after a drug bust. Look at Hamilton or Landis, who seem shadows of the men they once were. And compared to many, like Pantani or Jimenez (who both died of drug overdoses after living with suicidal tendencies) they seem lucky. None of this happened to Basso. His family life stayed strong. He seemed to take his punishment as a motivation to train even harder. His schedule became transparent, as well as his blood values, and he trained publicly like a Spartan for two years. His return was a disappointment. He targeted the Giro d’Italia, a race he’d won by ten minutes on the eve of his bust, and came in 5th. He vowed to do better in the Vuelta a Espana and did, but still missed the podium after getting smoked in the final day’s time trial that dropped him to 4th. This would be a career defining year for most professional cyclists but, for the guy who finished second in two Tour de Frances’, it was a major step back. The tifosi quickly dismissed him. 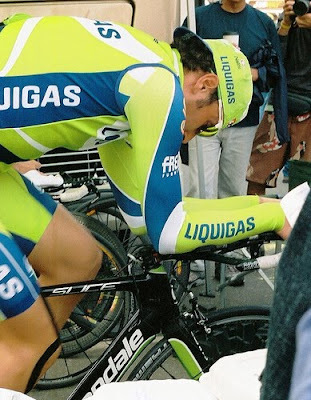 Instantly there was pressure for Liquigas to let Basso go in favor of supporting its two young stars, Nibali and Kreuziger. Another teammate, Franco Pellizoti, who finished third in the Giro, demanded to be the protected leader next year. Always the gentleman, Basso has offered to ride in support should those riders prove stronger. He also has a plan to ensure it won’t happen. It’s based on flexibility. Last year it wasn’t the case. Basso (like another former time trialing champion, Lance Armstrong) was decidedly average. According to the numbers he was 20-30 watts less efficient in his time trial position, a lack of efficiency that will never will a grand tour unless you can drop everyone on the climbs like Ricardo Ricco, which requires a blood haematocrit level that will now put you in prison. When we visualize hard training we think of pain and suffering. Basso suffered like a dog for two years only to see his performance go backwards. He then took the Armstrong approach and raced and raced. This seems logical when you’re trying to make up for time away from racing but it’s not scientific. It’s not how either rider gained success, which was by scientifically evaluating every aspect of performance and doing whatever was necessary to make it happen. Doping aside there were many other factors that set these riders apart. Flexibility is something we rarely think about in cycling, or almost any sport for that matter besides the obvious like gymnastics. 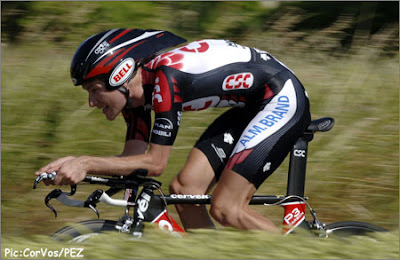 But the ability to get your body into an aerodynamic position while it’s still powerful is a massive advantage. While Basso was riding his “virtual Giro” and famous ticking off miles he probably wasn’t spending hours sitting in a quiet room stretching without a coach demanding it of him. It’s human nature. How many cyclists do you know that given a couple of hours would choose to stay inside and stretch rather than go for a spin? How many of anyone in any sport? All training, for that matter, leans this way. The first workouts that get dropped by our Beachbody customers are yoga and stretching. We get more emails complaining about these than all of our other workouts combined. Nobody asks why they should do cardio or lift weights. We are regularly questioned, or even challenged, about the validity of yoga. Athletic performance is about balance. Your body needs to be able to perform well throughout its range of motion. If it can’t you will suffer for it. These differences can be imperceptible. In these two photos of Basso there’s a 30 watt shift—podium or no podium—that may even avoid a trainer’s eye. Tony Horton tells us that he doesn’t look that way he does at 50 because he lifts weights, but because he does yoga. Basso has dropped his early season racing in favor of a flexibility program. There are lessons here, which we’ll get to see play out on Italian roads in May. My New Year’s resolution is to eat sustainably. This means that I’ll do my best not to contribute to the processed food market that’s run entirely on greed with an absolute disregard for human health. If you’re familiar with the books Fast Food Nation, Fatland, or anything by Michael Pollen you know the industry of which I speak. I’m done putting money in those people’s pockets, at least when I know I’m doing it. This doesn’t mean that I’m a vegan, vegetarian, Paleoist, low carber, Zoneian, or belong to any type of cult following. It simply means that I’ll reflect on the food that I eat and where it came from and make my decisions from there. Given the strange food culture we’ve created this is going to be anything but simple to accomplish. The broad strokes look like this. I will only eat animals when I know who killed them and how they spent their time on earth. For practical purposes this makes me vegetarian, at least until I make it up to Bozeman to delve into Josh’s freezer full of elk. I can’t eat fish because every fishery in the US has a mercury warning associated with it due to coal processing. The oceans are even worse. The only sustainable ocean creature to eat seems to be squid because their populations are booming as their natural predators are disappearing. I’ll do the best I can to buy local and avoid mass produced products made from the by products of genetically modified corn and soy production. The broad strokes will be challenging, especially when traveling. Beyond this my goal is to do a better job producing my own food. I don’t garden and barely cook, so this is going to require a lot of learning. But at the rate we’re soiling our own cage these are likely to become survival skills in my lifetime so I’d better become proficient. I’ll be writing more on mercury in the future. I recently had the pleasure of meeting Robert Kennedy Jr. You may not know much about mercury but consider that “1 out of every 6 women in the US now has mercury levels high enough to put their kids at risk for major illness.” He doesn’t get to mercury until 7:30 if you want to scroll ahead, though he’s making a case in the intro.